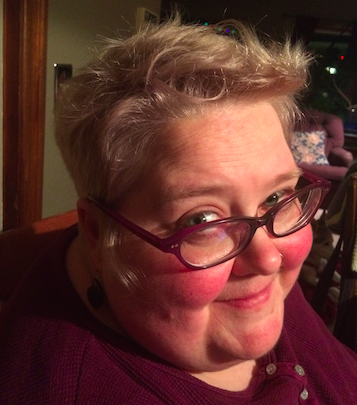 I am a fat, white, middle-class, queer, married, 38-year-old, childless college student. I have been fat all my life. Looking back at childhood pictures, I am amazed at what was considered “fat” but I guess I was. Now as an adult there is no doubting it. I am what is deemed a super-fat person. Bigger than the sizes at the plus size stores, even. I have to buy my clothes from a catalog. Like many people who have been fat for most of their lives, I became divorced from my body at a pretty young age. I lived from the neck up. I ignored my body as much as possible. Throw in some childhood through adulthood trauma, decades of binge eating and restriction cycling, a couple of injuries, years of living in intense body shame and all that comes with it, and the idea of ‘joyful movement’ as promoted by the Health At Every Size® (HAES) paradigm felt very foreign to me. I had incredibly strong blocks around movement. Just thinking about “exercising” gave me anxiety. I was introduced to HAES by Hilary Kinavey and Dana Sturtevant of Be Nourished at a retreat at Breitenbush Hot Springs in the Cascade Mountains of Oregon in March of 2014. What I learned sitting in that circle in that yurt began to change how I viewed my body and food immediately. Once my eyes were open to the truth that lives in HAES, I knew I could never close them again. I am so incredibly grateful that I have the privilege to build a HAES friendly support team. My primary care physician, my therapist, my acupuncturist, and my massage therapist and others have all helped me heal my relationship with my body by leaps and bounds. After a year of HAES informed therapy, and lots of healing with the help of my whole team, I was ready to try this joyful movement thing. But I needed help. Then I met Julie. The first time that I sat in the studio with Julie, I was pretty nervous. I had heard she was amazing. I heard she made people feel safe. I also heard she lived in a normal sized body. Sure enough, when I showed up, I was greeted with a smile by a woman who could easily be on the cover of a yoga magazine. Julie started the class with us all sitting on our mats in a circle. She acknowledged her thin privilege. She acknowledged the sanctity and sacredness of every body exactly as it is. She talked about how she has come to learn that yoga can be an experience of meeting your body rather than trying to overcome your body. With Julie’s guidance, I got to explore my body in a safe place with other people who were also used to feeling ostracized in movement environments. I was routinely delighted to find out what my body could do. And I was often frustrated to learn what it couldn’t. I tried to remember to let go of expectations and simply be with my body however it was. Over time, I started learning about my body. Now, I explore the world that is my inner thighs as I reach through to my feet, the feet that meet the ground, the ground that holds me every single day. When I sit in a side-bend and reach my left hand up over my head, I love the feeling of the long line between my hip on the floor and my hand in the sky, my ribs stretching like an accordion in between. Old patterns of judgment and self-loathing sometimes come up while I’m on the mat, and when they do, I have learned to meet myself with kindness and self-care. On those occasions I find myself dissociated, my head floating like a balloon, I’m able to use breathing and embodiment techniques to call myself back home to my body. Working with HAES informed movement specialists has been a total game changer for me. Re-learning movement in a safe and supportive environment has helped me create a relationship with my body that I never knew was possible. My body used to feel like an amorphous blob that I tried to avoid paying too much attention to. I wasn’t quite sure where I ended and the rest of the world began. Most of the time I felt numb. When I did get a sensation message from my body, it often terrified me. The feeling of my own heartbeat sent me into anxiety. Losing my breath at the top of a flight of stairs, I was awash in shame. I’ve learned to associate the feeling of losing my breath as part of movement. It happens to everyone. Not just fat girls. I recently started going to the pool at my local community center. I took some swimming lessons to refresh my memory on the basic strokes and I found a love for Aqua Zumba. I bounce around in the water with twenty-something other women of all shapes, sizes, and ages. I didn’t check to see if anyone at the community center knew about HAES before I started going. My time with Julie and Susanne has helped me build the confidence I need to show up at a pool in a swimsuit and be 100 percent totally ok with it. Ok, 95 percent ok 95 percent of the time. It’s not always easy living in my body. I still get triggered sometimes and feel like something is wrong with me because of my size, that I am a person in need of fixing. That my body is a problem to be solved. We all have bad body days. But I’m learning to take up my space. On the outside, my body looks pretty much the same as it has for the last several years. But on the inside it feels so different. I’m learning to feel the power and strength that lives within this body. It’s always been there. Activity has simply enhanced these qualities and made them more accessible to me. I am so incredibly grateful to Julie and Susanne for being such wonderful guides in my journey back home to my body through movement. I live here now, in this body, and I am proud of it. Everyone deserves the opportunity to find joyful movement and embodiment. And everyone deserves to have people supporting them along the way. The world needs more HAES-informed movement specialists. In school gyms, community centers, yoga studios, swimming pools, dance studios—every place where people go to learn how to move in new ways. Everyone deserves to have easy access to support for movement and activity that is weight-neutral, respectful, and life enhancing. Mikalina Kirkpatrick is a writer and a student in the Portland State University Women, Gender, and Sexualities Studies program. She lives in Portland, Oregon.